By the RF jack the C64 can use a TV as monitor. The signal contains the picture and sound information in one. The control dial is used for adjusting the frequency of the HF modulator. 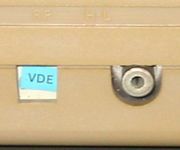 The RF jack is a cinch connector (RCA jack). The HF signal is used by the PAL version (Europe) in the UHF aera (470-862 MHz) on channel 36 (picture carrier on 591.25 MHz). For the NTSC version (USA) in VHF aera (174-230 MHz) on channel 3 or 4. The impedance is 75 Ohm. 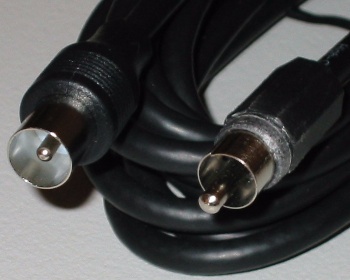 A typical RF cable for connection between the C64 and a TV. A the left side of this picture the RF connector, at the right side a chinch connector. This page was last modified on 1 April 2018, at 16:11.